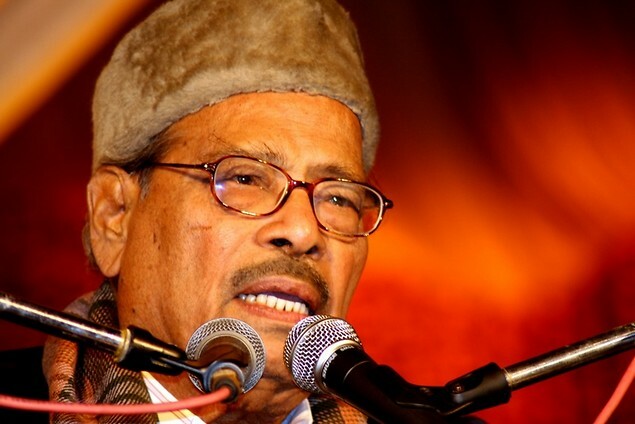 Play back singer Manna Dey is dead.He breathed his last this morning at a private hospital in Bangalore. Reports said Dey was admitted at a hospital where end came around 3.50 am. “He died due to multi organ failure,” a report quoting ‘sources’ said. Dey(94) had been admitted to the hospital due to age related complications. The singer’s body will be kept in state at Ravindra Kalakshetra in Bangalore till noon on Thursday to facilitate his admirers, well wishers and fans to pay their last respects. Music lovers and Bollywood paid tributes to him. *Shabana Azmi: Manna Dey had a unique voice. He will live on through his songs Ai Meri Zohra Jabeen/ dil ka haal suney dilwala/ poocho na kaise maine RIP. *Mahesh Bhatt: Manna Dey passes away. His voice shall linger forever.R.I.P. *Sunidhi Chauhan: Heartbroken at Manna Da’s shocking demise. *Shaan: From Rock n roll to pure classical to melancholy to slapstick… no one like Manna Da! Long live Manna Dey! *Shreya Ghoshal: Zindagi kaisi hai paheli, Puchho na kaise, ek chatur naar, aao twist karein, aaja sanam madhur.. Such versatility and command over all genres. Rest in peace Manna Dey saab.. You and your voice are immortal.. Your songs will continue to inspire millions forever. Page rendered in 0.0608 seconds.